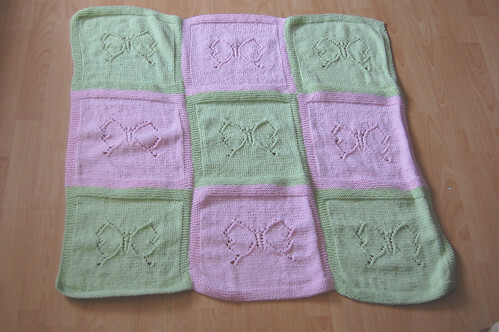 A cute, feminine baby blanket featuring a lace butterfly motif. SIZE: 36 inches by 36 inches. Dimensions can be adjusted by changing the number of blocks you knit. SSK = slip two stitches from the left need to the right needle, insert left needle into the front loops of slipped stitches and knit them together. With your main color, cast on 59 stitches. Repeat these 2 rows 6 times (you should have 14 purl ridges in your garter stitch border at this point). End on a wrong side (WS) row. Repeat these two rows 6 times. (You should have 37 purl ridges in your garter stitch border at this point). End on a wrong side row. Knit all stitches for 12 rows. You have now completed one block. Cut yarn and add on a contrasting color. Repeat all instructions to form another block. Cut yarn and change colors again (either back to the original color or you can add in another color if you like). When you have a strip consisting of three completed blocks. Bind off. Create two more strips of three blocks, alternating the colors so that the blocks form a checkboard pattern. Sew strips together and weave in loose ends. I’ve actually made a few blocks of this…cool pattern though I mess up somewhere in the middle of the motif and think one of the stitches is wrong. The initial blocks I made were in acrylic though, so I don’t like them very much and am going to make one that is pink and red. I need some help here. I was so happy to find this pattern on ravelry as it is exactly what my sister is looking for in her first baby blanket. I am at the part where I should be starting the butterfly motif, but if I add up the stitches in the first row, the pattern has only accounted for 57 and I’ve casted on 59. The ravelry page said there were some edits and I’ve gone to all the links and the patterns are all the same. Where is the updated version? Help! Thanks, in advance. Also, I’ve counted 3 decreases in that first row with 4 increases (which adds a stitch). Is that correct? Sorry to be bothersome, just want her blanket to be right. ROW 1: (RS) K16, K2T, (YO) 2X, SSK, K19, K2T, (YO) 2X, SSK, K16. I have corrected the pattern and hopefully everything should be smooth sailing for you from here on out. If you run into any other trouble, please let me know and I will do my best to sort it out for you. I am sorry for the confusion. Good luck on your blanket. I would love to see a picture when you get it done. When you sew the strips together, do you block first? Thanks.